A sunny morning at the beautiful Hendon Town Hall on Wednesday 13 March welcomed the arrival of over 30 university students, organisations and university staff nationwide for AccessHE’s Life After University 2019 event. Students travelled down from areas as far and wide as Leeds, Lancashire and Manchester for what proved to be an empowering day of conversation, skills and confidence building in an intimate and comfortable setting. Aimed at care leavers, care-experienced and estranged students currently studying at university, Life After University 2019 was designed to ease common concerns faced by such students and support them with successfully navigating the transition into independent living after graduation. 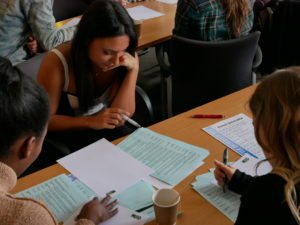 Students were eased into the day with a warm introduction by Tanyel, AccessHE London Programmes Coordinator, followed by a bustling game of human bingo. Ice broken, the morning then adopted an “employability” theme with Middlesex Employability up first, followed by a practical insight into video interviews from financial services employers M&G Prudential, who revealed that 49% of graduate recruiters use video interviews as part of their recruitment processes. During the networking lunch, attendees mingled with representatives from a range of organisations and employers in the financial services, science/engineering and public sector. In between being fed and watered, the students visited drop-in stalls hosted by Become and were signposted to the services of Smart Works and Suited & Booted, both offering one-to-one job interview preparation and practice for female and male attendees respectively. In the afternoon, the students heard from and posed questions to a diverse panel representing areas of wellbeing, finance for care leavers, life coaching/entrepreneurship and employability. The attendees were left particularly captivated by the words of wisdom shared by Zach, a care leaver now working for Drive Forward Foundation. This remainder of the afternoon taught the importance of looking after yourself through a mental health and wellbeing workshop by the Middlesex’s Wellbeing team, closing with an advocacy-themed session on using your voice for change and build the society you want to live in by the Drive Forward Foundation. We’re at Hendon Town Hall today for the @AccessHE ‘Life after university’ event. Feedback for the event has been amazing and we’d like to thank all the staff that were involved in putting together this special day. A big thank you also, of course, to the students who attended and enthusiastically made the most of the opportunity from the offset. We look forward to even greater things in 2020. Life After University was put together by the AccessHE Care Experienced and Estranged Students forum, hosted by Middlesex University London. If you’d like to know more about the event or the forum’s work, or you a student/soon-to-be-graduate interested in being involved on the panel next year, contact Tanyel Kazim, London Programmes Coordinator, at tanyel.kazim@londonhigher.ac.uk.